General Chamberlin, before his death in 1944, was generally acknowledged to be America’s greatest horseman. Brig. Gen H.D. Chamberlin studied at the French (Samur) and Italian (Tor di Quinto) cavalry academies in the 1920’s. 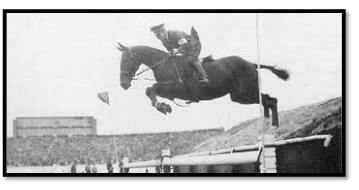 He brought modern Italian and French concepts home to the U.S. Army Equestrian Team in the 1930’s and early 1940’s. Chamberlin’s method was generally based on the Italian school of Caprilli. His books, which included the Fort Riley Cavalry Manual, set forth these ideas very clearly. Fort Riley pupils (enlisted men and officers) had an enormous influence on American riding from at least the 1930’s through the 1970’s. One of Chamberlin’s most famous books, Training Hunters Jumpers and Hacks, was first published in 1937.